After years of procrastination, Land Rover has confirmed that the new Defender will be unveiled in 2019 and they’ll arrive in dealerships in 2020. That suggests, to us, that the reveal will be late in the year – possibly at the Frankfurt Motor Show, where the DC100 concept was shown in 2011. 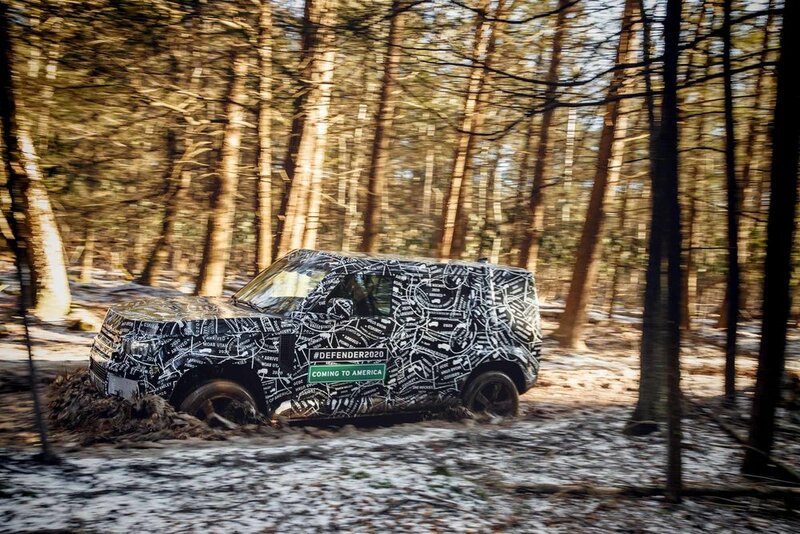 The press release is a bit of a teaser and includes the line: ‘With an all-new exterior and interior design respecting Defender’s unmistakable shape…’ We’ve spoken to people close to the vehicle and they have said that they have never known a body-test mule so well camouflaged. So, what we see in the picture isn’t what we’ll get, and it may look closer to an old Defender than we expected. After all, if they could designers could redesign the Evoque and keep its looks, retaining the boxy shape of the Defender should be a doddle. The above pic shows a mule in testing in North America – the Defender hasn’t been available in the US since the short-lived NAS 90 and 110 models of the 1990s and, we understand, the US market is key for Defender. In fact, we believe the original replacement’s design was shelved as it didn’t look enough like a Defender. Testing in North America will see the Defender mules operating in temperatures from -40°C to +49°C on- and off-road and at altitudes as high as 13,000feet – the height at which aircraft must carry on-board oxygen – so they’ll certainly get a good work-out. 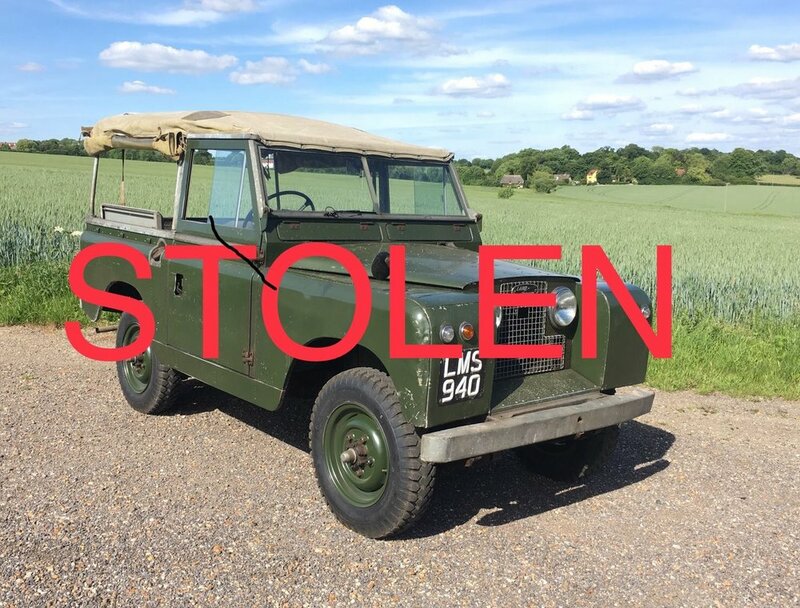 Sadly, there doesn’t seem to be any abatement in the number of Land Rovers being stolen. Spend any amount of time on social media and within a day you’ll see at least a couple of mentions. Land Rovers have always been the target of thieves. I even bought a Disklok for my Defender before I had picked up the vehicle. And that was over 15 years ago. So we know there’s an issue, but why aren’t people doing more about it? ‘The police should do more to catch thieves,’ is often shouted. But, hey, what about preventing the thefts from happening in the first place? ‘If a thief wants it, they’re going to have it,’ is the reason some give for not securing their vehicle. But isn’t that just making life easier for a thief? The first thing to remember, though, is that if you are a victim of crime, you are just that. A victim. It is not your fault. You didn’t make the thief take the vehicle. 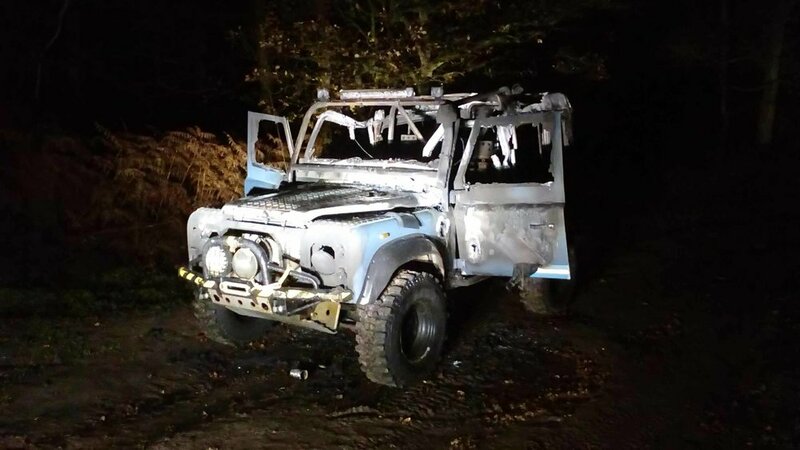 I came across the sorry state pictured above while greenlaning at the weekend – and in the time between me reporting the find to the police and friends of the owner finding it later that evening, the wheels and tyres, and winch bumper had been stolen from the burnt-out shell. Land Rover security on older models is pretty poor, and it’s fairly easy to get round. Newer Land Rovers are much better, but they face different problems, with thieves stealing them by hacking the electronics. 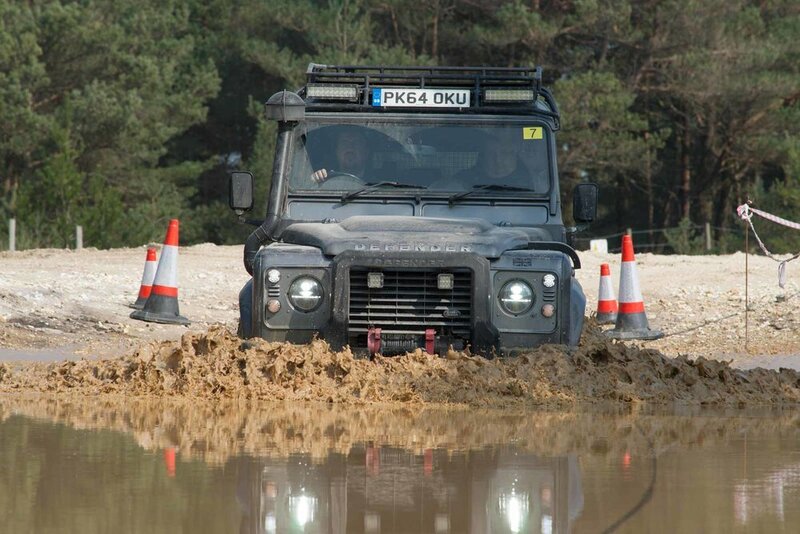 So, what can you do to protect your Land Rover? Simple – add layers of security. Don’t expect the factory-fit kit to protect the vehicle; at the very least add one item. And the more you add, the safer it should be. All security products will be vulnerable in one way or another, so the more you add, the harder you’ll make it. The most obvious item is a strong, visible deterrent. A strong steering wheel lock will make a thief think twice – at the very least, they’ll make some noise removing it. This sort of product is ideal for all Land Rovers, and is a good mechanical barrier to counter thefts using electronic equipment. Other mechanical devices, like pedal and gear lever locks can also add to the layers. Next, you should consider some sort of immobiliser. This can be a hidden switch on older motors that simply prevents the engine from being started, to a more sophisticated one for newer vehicles. Some insurance policies insist a Thatcham-approved immobiliser is fitted. Those will slow a thief down, increasing the chance of them being caught, which most don’t like. But, if your Land Rover is stolen, you’ve got more of a chance of finding it again if it’s fitted with a tracking device. It’s well-known that many stolen vehicles are ‘parked up’ after being stolen – they can’t risk taking it somewhere and it transmitting its location, leading police straight to them. Those are the basics and won’t cost more than a decent accessory for your Land Rover. But, what more can you do? Security mark the vehicle. Land Rovers are easily dismantled and there is a good demand for secondhand parts. If you etch all of the windows and tag other components, they can’t be sold on and they can be traced. Plus, marked items are too hot to have kicking around. Oh, and fit security items to prevent parts from being stolen from the vehicle – there was a spate of Defender doors and bonnets being stolen from parked vehicles, but accessories are also vulnerable. Getting back to protecting the vehicle, lock the Land Rover away. Unfortunately, most Land Rovers don’t fit in domestic garages, but if yours does, lock it away. If not, and you have a drive, consider installing security posts. If you park on a road, make sure it is well lit, and don’t make it an obvious target by leaving tempting stuff inside it. In the run-up to Christmas, make sure that any purchases are hidden away. If your Land Rover or Range Rover has keyless-entry, store the keys as far away from the front door/outside walls as possible. Thieves try to build a ‘wireless bridge’ between the fob and vehicle. If they can’t pick up the fob’s signal, they can’t easily steal your pride and joy. Putting fobs in a Faraday bag or even a metal box will reduce the signal range. Hopefully, that will all go to help keep your Land Rover safe, but, inevitably, some will still be stolen, no matter how well secured they are. Julian Shoolheifer’s very original Series II was taken from a locked barn a couple of weeks ago and is still missing – it must be somewhere. There are a few groups on social media where reports of stolen vehicles are posted to that are worth keeping an eye on. The biggest is LandyWatch, which has been around for yonks (it was previously a website) and has almost 15,000 followers – so any stolen vehicles posted to it are likely to be seen by a large number of people. Members also post up suspicious vehicles – or ones where the Land Rover just looks out of place, meaning some stolen vehicles have been recovered. We won’t be able to stop all thefts of Land Rovers, but if we all do our bit, the numbers going will, hopefully, drop. What do you mean you can’t see the new model? It’s there. But such is the demand for Land Rover’s baby Range Rover, they decided to keep the styling familiar, while changing almost everything. So, despite looking very similar to the original – and hugely successful – model, the only body parts carried forward from the original Evoque are the door hinges. The more you look at it, the more you spot. Differently sculpted doors, thinner headlights, larger wheels, tweaked wheelarches, everything has changed subtly. And it’s built onto a new mixed metal platform too, and has a 21mm longer wheelbase – giving rear seat passengers 20mm of extra leg room. It may not sound huge, but an extra three-quarters of an inch could make all the difference. If that’s not enough, new rear suspension with lower top damper mounts increases the load space significantly, and better storage has been designed in throughout the vehicle. And Velar-esq touches abound throughout, with the twin-display Touch Pro Duo centre console and retracting door handles. Plus the model gains some of the hi-tech environmentally-friendly fabrics first used on the bigger model, as well as some new fabrics. And it’s environmental credentials which will elevate Evoque 2 over the first-generation models. A year ago Land Rover announced that all new models would have electric options and apart from the two-wheel drive model, all of the first batch will have either petrol or diesel MHEV mild-hybrid drivetrains. Essentially, energy will be stored in the underfloor batteries when the car comes to a stop, then, when you accelerate you’ll augment the power from the internal combustion engine with electric power, improving performance and reducing emissions. And, as you’d expect, the diesel engines are ultra-low emission EU6. What’s more, a three-cylinder plug-in hybrid PHEV will be coming in a year’s time. That will see the front wheels driven by internal combustion and the rears driven by electric – there won’t be the traditional power to all wheels through a transfer box and propshafts. Even that has changed on Evoque 2. The rear drive automatically decouples on the road when not required, saving fuel, but a twin-clutch rear diff means you get similar performance to that gained with an electronic locking rear diff when you’re off-road, improving off-road ability. Oh, and the wading depth has also increased to 600mm. On top of that bi-metallic brake discs shave off 1.2kg per corner – that’s a lot of unsprung weight gone – and combined with the new suspension setup and lower engine mounts on the torque axis of the engine, you’ve a significantly improved drive for both on- and off-road. As well as answering complaints about loadspace, Land Rover has also dealt with visibility issues. Door mirrors have been re-positioned to improve forwards visibility and a rear camera system, mounted in the shark’s fin antenna, transmits a live 1.7 megapixel feed to the rear-view mirror, so you’ll have a clear view of the road behind you, no matter what you have in the rear. Engineers tell us that the image is far clearer than you’ll get looking through the glass – and is especially good in rain and in the dark. Unusually for the premiere of a vehicle, we got the chance to test some of the Evoque 2’s new features over Land Rover Experience’s Terrapod, getting to see how the new cameras work – and they are all impressive. We drove through a swimming pool to test the wading depth and a side-slope for the other capabilities. This is still a Range Rover after all. The only thing I found that I don’t like, purely for styling, are the new fabric seats. The leather ones are fantastic, as you’d expect, but the two-part eucalyptus or Kvadrat wool-blend ones have a hint of 1980s Sergio Tacchini-style about them. Which is a shame, because, I think that Evoque buyers will want to embrace the environmentally-friendly fabrics and this model could see a significant shift from traditional upmarket leather trim to new fabrics. All-in-all, the new Evoque 2 may look similar to the old one, but it is so much better. Land Rover are onto another winner. The Range Rover Evoque 2 starts at £31,600 and the first ones will be in customer hands in spring 2019. 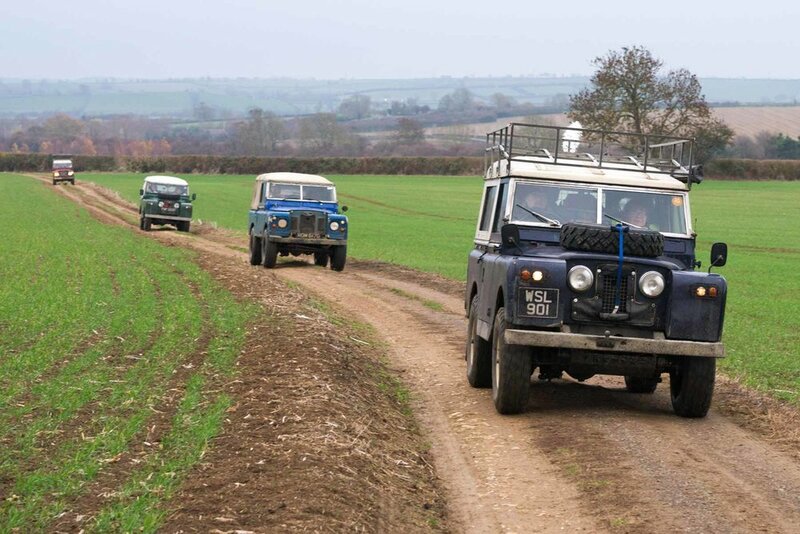 For more details go to the Land Rover website. 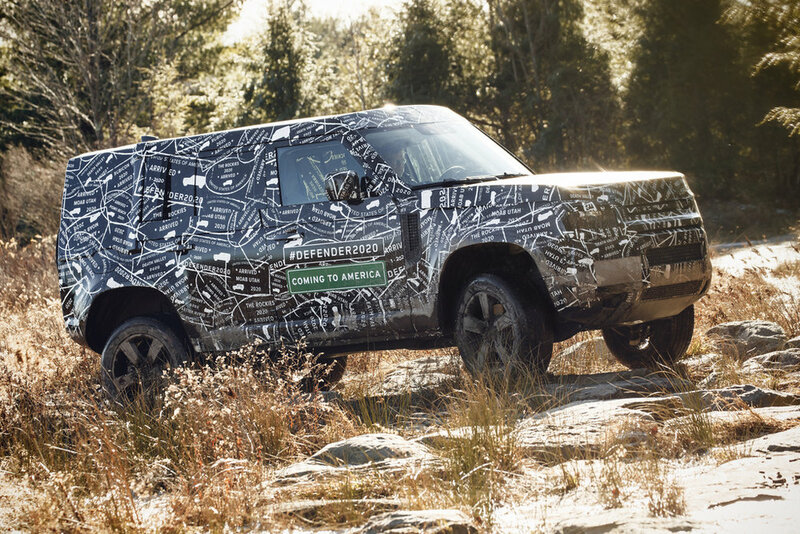 Twisted Automotive aims to celebrate Land Rover’s history with its plans for 80 brand-new Defenders. The Land Rovers – the final vehicles from when the Yorkshire specialist undertook what it describes as ‘the biggest risk of its history’ by investing £7.4 million to reserve 240 of the final Defenders to roll out of Solihull – will be prepared and enhanced in batches. 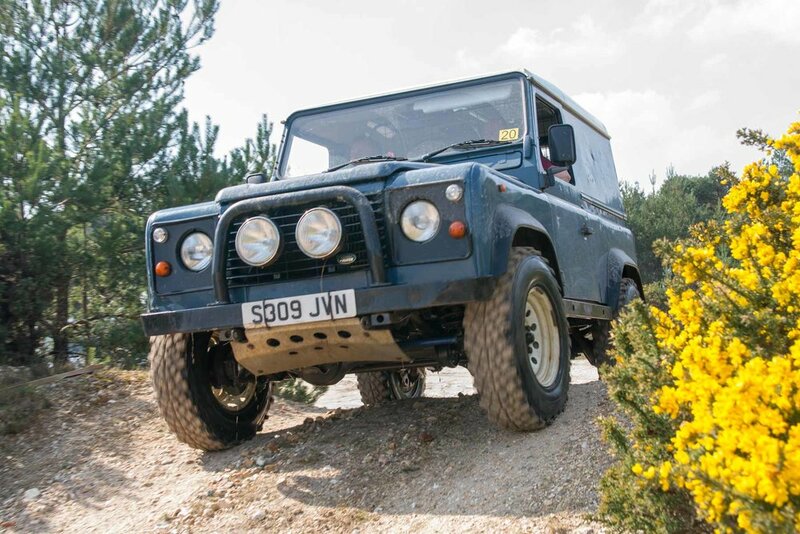 Forty-four ‘Remake History’ Defenders will pay homage to Series models and will be released on 29 January 2019, exactly three years after production ceased. Meanwhile the final 36 will be built under the ‘Make History’ banner, modifying them to a unique spec and offering them only to existing customers. Longer term, Twisted will ‘Rework History’, carrying out restoration work and engineering improvements to high-quality pre-owned models. To whet our appetites for next week’s launch of the Evoque 2, Land Rover has placed a series of full-scale wire models outlining the car’s futuristic contours in glamourous locations around the capital. Expect a slightly smoother appearance than the current model, with elongated rear lights that, erm, evoke those on the Range Rover Velar. What’s remarkable is just how faithful the design remains to the LRX concept, unveiled back in 2007. But while that original shape introduced dramatic new styling that would filter through to the rest of Land Rover line-up, the Evoque 2 takes a more conservative, minimalist approach. Details about what will underpin the new model are scarce. The best guess is for a slightly elongated version of the existing platform; a hybrid option should also be available, unlike the current Evoque. It’s eight years since a struggling Jaguar Land Rover put the original Evoque into production. Since then over a quarter of a million have been made at Halewood and worldwide, transforming the company’s fortunes and building the foundations for its growth until this year. To watch the reveal live, tune into Land Rover’s Facebook or Youtube channel at 7:45pm GMT on Thursday 22 November. Okay, Be Prepared is more of a Scouting mantra than a military one, but it applies equally to military life. And, for once, I am prepared – well, relatively, anyway. I’m at GEMM 4x4 Mudmaster, an off-road navigation/driving competition based in Glasgow, run jointly by the British Army Motorsports Association and the Scottish Land Rover Owners Club. Having competed for the past four years, winning in 2015, I’ve decided to marshal this year and assist my regular crew-mate Phil Griffiths in creating and running the final phase of the competition. You see, Mudmaster is a multi-venue event, with the competition taking place on private land, linked by road sections. The aim is to get round the entire route without picking up penalties for driving or navigation errors, and it’s the lowest score wins. We’re just getting ready for the drivers’ briefing when we hear there has been an accident on the M8 – and an amendment to the route is issued, taking competitors off a junction early to avoid it. We’ve waited around for the briefing and, as it has overrun, we’re now short on time – just 15 minutes before car 1, last year’s winners Gordon and Lisa McCheyne, leave. We’d best get going. Rather than being in our normal vehicle for this event, the LRO 90, I’ve bought our 2012 TDCi Defender 110 Utility. I’ve bunged our set of BFGoodrich Mud Terrain KM3 tyres on it and loaded the back with all the gear we may need, but hopefully won’t, from recovery kit to fire extinguishers – and we have a key to open the gates on the forestry land. We head off and immediately find that the M8 doesn’t exist on my maps – so we pull off a junction early, just in case. Then, by mistake, we rejoin the motorway, and the back of the queue. D’oh! Fortunately, it has reopened, and we’re back on track and we get down to the first forestry track and are pleased to find the gate open, and Bobby and Ross manning the time control at the end. They’ll be course closers after the final vehicle has been through. Turning south, we aim for the next set of woodland and open the gates before dropping into Worm Law. This has been set up as an orienteering section and with 61 vehicles coming through – 37 civilians and 24 military (plus 13 MAN trucks doing a slightly different route) – we stop to inform walkers and cyclists what is going on. All are cheery and thank us for letting them know. We’re only a few minutes head of car 1 now, so we do a quick sweep of the route, checking for any gates or obstructions that may hinder progress and make our way to the exit. The great thing about these events are the people involved in running it. Off-roading legend Brian Hartley and his crew are marshalling this phase and when we reach the end, we find Stuart Bankier and friends running the time control. Until recently, Stuart organised the Berwick Classic Rally that Phil and I compete in, so we had a quick catch-up. Then it’s onto the first trials of the day, before a mandatory lunch stop – giving us a bit of time to catch a breath and allowing me to take some photos. But time waits for no-one, so we soon head off and leapfrog the lunch stop and snack at the next section – four more trials sections at regular site Ballencrieff Mains, just north of Bathgate. Dean Pugh is acting as official and shadowing the event in his L322 Range Rover, and, egged on by some of the marshals, drives the Range Rover into a very boggy section and gets stuck. Fortunately, help is on hand to extract the stricken vehicle before the competitors arrive, so no-one will ever know about it. We clear a speed check well within the limit – speed guns are deployed on the event to ensure drivers are adhering to high standards – and open the next section of track before reaching a driving test in a farmyard. We’ve a few minutes to spare, so it would be rude not to try it. Now, I’m not bad reading maps, but I can’t seem to get the hang of test diagrams and we nearly ‘wrong test’ it, but Phil retraces our line and we clear it well within the allowed time. Then Gordon arrives in car 1, with other vehicles following behind. We’d better get going again. The Carron Valley forest is legendary on Mudmaster events. Not because of the stunning scenery, but because so many crews get it wrong. We check-in and head on through. We’ve got GPS mapping running, in case I need it – we need to be on the right track at all times – but the crews don’t have that luxury; they’re going old-skool with paper maps. Exiting the forest we don’t spot a close marshal, but there’s no marshal point indicated, so perhaps there shouldn’t be one – anyway, we continue on, down the stunning Campsie Fell and into Lennoxtown, where the final forest section waits. We open the gates and head for the final control, allowing the marshals to head off and grab a brew while we wait in case anyone arrives before they return. We’re done for the day, but it’s getting dark now – they may need extra marshals to sweep Carron Valley, so we return to the start and wait for the crews to finish arriving before deciding to head in. Just as we’re saddling up, we spot a Wolf 110 almost get to the control, turn around then disappear off. We head off to investigate and see it turn off along another track. It has stopped, but in the gloom it no longer looks like a Defender – the shape is wrong, so we investigate. The crew had realised they had made a mistake and tried to turn around on a flat piece of land. Unfortunately, it wasn’t flat but a big hole and the Land Rover was leaning at 45 degrees and cross-axled. The crew are understandably quite relieved to see us – we attach a rope to the Jate ring and tow them onto the flat, guiding them to the marshals at the start of the section. We allow them a few minutes and when Bobby and Ross arrive, we head off to check the lower section for stragglers, while they take the higher road, which the crews should be on. But as we reach the first junction we catch up with the crew again, looking a bit lost. We point out the way they need to go, and we go the other, meeting a set of headlights coming towards us. Another lost crew. As time is rolling on, we get them to follow us to the exit, where they can rejoin the route on tarmac. 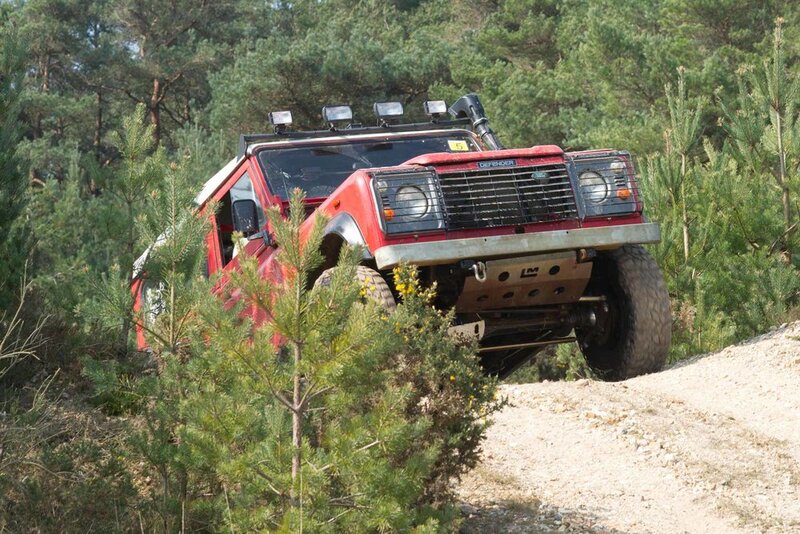 Phil and I hang around for a bit and spot headlights coming down the hill, but it’s not competitors – it is George from GEMM 4x4 in his Discovery pick-up – the second closing car; slightly worrying as we know there is at least one crew still in the forest. We wait for fifteen minutes then leave – there are enough marshals to sweep the forest for lost souls, and we drive along Campsie Fell again, but this time we’re treated to a fantastic vista of the twinkling lights of Glasgow at night. The temperature is dropping and we get speed-checked again by military police in Lennoxtown (we’re way under the limit again, thankfully). They haven’t seen sixteen of the crews, with only one having arrived in the past 15 minutes – we decide to head in and drive the route, just in case – and immediately find four Land Rovers – three military and one civilian – heading the wrong way, hopelessly lost. We turn them around and lead them out and to the final control of the day. We’re done too, so call it a day – we’ve still got our phase to run tomorrow. The Land Rovers are covered with a hard frost when we head out to them and we’re thankful for heated windscreens. Once warmed up, we go to the training area just south of Cambuslang, where we’ll be doing our utmost to confuse the crews. They’ve started with a couple of orienteering sections and are making their way down to us via more trials. We check our phase – called Clockwiser – works, then I head up the hill to make sure any gates are open. 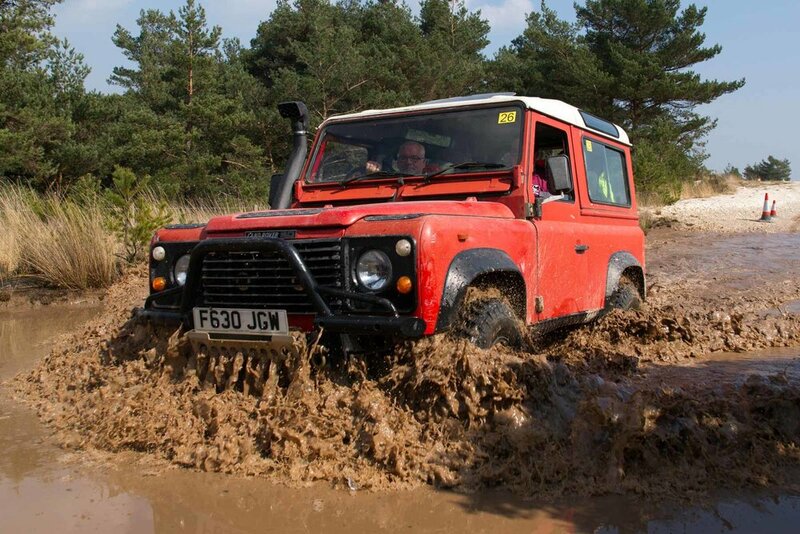 The muddy track tests the capabilities of the BFGs, and traction control kicks in to help ascend the soft climb. It’s a long drive to the top of the hill, but it’s clean. There’s no way we could have sent 60+ vehicles up it, but they should be fine descending it, though I do put out some caution boards to slow the crews down. I’ve just put the final board out when car 1 arrives and our phase is live. The aim of Clockwiser is to have a bit of fun. No maps, no difficult navigation – you just arrive at a board and the number on it tells you which direction to go next. So, if it’s 12, you go straight on. A 3 means 90 degrees to the right, a 9 is 90 degrees to the left, etc. But the crews have to note the numbers down and don’t finish until they have added them up and given us the total. We’ve given them a very generous bogie time to beat – well below a 10mph average speed – but some of the terrain isn’t the smoothest. The first few vehicles have it toughest, as they should. When we designed the 2-mile route we purposefully didn’t drive in straight lines between the boards, so the crews would have nothing to follow. And with some of the grass being above bonnet height, some of the route isn’t clear – and they have to make a leap of faith that they are going the right way. We know it’s plotted correctly as we’ve used a compass to measure the angles – and each hour on a clock is 30 degrees – so when you arrive at a point and see a 7, you have to turn 150 degrees left, focus on a point and drive straight to it. Everyone got the route right, but not everyone managed it in time, or added the numbers up correctly (it was 222, if you wanted to know). With the last vehicle through, it was a case of clearing the site and heading back to the 154 (Scottish) Regiment RLC base for the group photo and prizes. It’s good to see many of the civilian crews returning and there were quite a few familiar faces in the military – it must be one of the most enjoyable military excercises going. On top of that, eight crews made the short trip across the Irish Sea from Northern Ireland to compete – and they’re going to try to encourage crews from the south to come next year. Winners this year were Kevin Fulton and Alan Morrison in a 90 pick-up, with just one penalty point, narrowly beating Chris Moir and Andy Couper on furthest cleanest, and Gordon and Lisa McCheyne finished third. It’ll be back next autumn and we’ve a couple more fresh ideas ready to throw into the mix – see you there. Run by Kirkby Lonsdale Motor Club for vehicles of a specification pre-1986 and with a route of 170 miles, eight tests and loads of regularity sections, it’s a test of both driver and navigator. Sounds fun. And as we’re just a course car, we don’t need to be in an eligible vehicle – though we each own one. After literally moments of thought, we concluded the LRO Freelander would be the ideal closing vehicle. Fully roll-caged, with bucket seats, harnesses, massive sump guard, Cibie Super Oscar driving lamps and BFGoodrich Urban Terrain tyres, the otherwise-standard 1.8-litre Land Rover also has a drop-down rear window, making collecting marker boards a doddle. We’d be able to press on when needed and may be able to assist others. If you’re not into the scene, road rallies are about as grass-roots as you can get with motorsport. All you need is an eligible vehicle, a navigator and off you go. You don’t need to make any mods, though more competitive drivers will often fit a sump guard and a roll cage, just in case. The only thing that is now becoming an issue is the cost of the vehicles on this sort of event – pre-1986 cars are gradually increasing in value and many owners simply won’t want to risk their pride and joy. But for those who do, there’s plenty to go at – and the vehicles competing on this year’s Devils Own Rally range from 1930s Bentleys to 1980s hot hatches. Being course-closure means that we’re the vehicle the crews don’t want to see. We start off just behind them and as long as all of the vehicles get through the time controls (TCs) we can continue after them. But if one goes wrong, we need to wait a certain amount of time for them to find the correct route and for this event, it’s 15 minutes – any later and they’re Over Time Limit (OTL) and have fallen out of the rally, though they can rejoin further along. So, we watch the vehicles through the first test on a farmyard half a mile from the start, then head off. We’re the second closing car, picking up the boards; there’s another in front of us collecting the timing clocks. All competitors make it through the first two controls, but we’ve lost one by the third, so we wait for OTL and close the control. Now it becomes difficult to regain time. Although it’s not a race – the vehicles have to average set speeds below 30mph – as we have to stop and collect the boards, we can easily fall behind time. At least we have marked-up maps showing our route, and where the controls are; the crews have to plot their routes from information given. We arrive at the next test at OTL, so Phil and I drive it, blasting the Freelander round the cones in a quarry. We’d be nowhere near the times of the top crews, but it builds the adrenaline nicely. Some of the vehicles are falling behind and by the time we arrive at Test 6, we’ve managed to get ahead of five, but as we’re not collecting the clocks, we hold back – so they all get to drive it. Elliott Dale in a Bentley Derby is running very late, having bust his rear diff on a previous test – he’s rebuilt it by the side of the road and has rejoined the rally. A quick coffee break is followed by a run that takes in Winster Ford. When we arrive the recovery crew are stowing their ropes – with the water level about 350mm deep quite a few of the competitors have needed their services but the Freelander shrugs it off, though the brakes do suddenly dissipate all of the heat that has built up. A maze of lanes follow and I’m calling the junctions thick and fast while Phil concentrates on the road. ‘CROSSROADS,’ I yell, and Phil stamps on the brakes and we skid to a stop just short of the junction, before the Give Way line. Phew. Another test in some woodlands sees us catch up with the tail-enders, then it’s on to the Lakeland Motor Museum for sandwiches and a short break. It also allows us time to jettison some of the boards that are rapidly filling the load area. It’s getting dark now and the lights are coming into their own. We get to the start of a regularity only to find we’ve lost another car, so have to wait. And Roger Powley in his Porsche 911 has managed to get bellied on a greenlane, off the rally route, in Grizedale Forest – could we help? We head in and have a look. We assess it and decide it needs to be winched, so leave it for the other closing car to remedy, while we become clock car and board collector. Now the pressure is really on. We make our way through the empty Grizedale Forest at a sedate speed (probably) and exit – a long transport section beckons and as Phil drives, I work out our timings – we should get to the TC in time, then be slightly ahead. We close it down, and start on the next phase of the event. We’re about to close a passage control, but get passed by a competitor – how did we overtake them? We’ll have to wait until OTL now. Nine passage controls in the space of three miles means we’re not even getting out of 2nd gear, but we have to do the entire route, just in case. Direction boards through farmyards need to be unscrewed and stowed, and we’re starting to fall way behind – the marshals will wait for us to reach them, unless they need to move onto another control – so we need to be prompt. Then fog starts to descend, reducing visibility. Phil is a native of Cumbria, but doesn’t know these roads well enough to risk going quickly, but fortunately it clears as we drop down off the moors. The air is damp and the Freelander’s screen is misting up – the persistent light rain is clinging to everything and the hardy marshals are very pleased to hear the magical words: ‘closing car’. They can get home and into the warm; we’ve still got 90 minutes to go. We enter a corner on a farm track quickly, only to find a cow in our path. We patiently wait for it to move, then gingerly continue, opening it up again once we’re over a cattle grid. Despite all its reliability issues, the 1.8 Freelander can take a lot of stick and we redline it in first, second and third to get back up to speed on the mud track. The route takes us into another forest and we’re asked to assist the crew of a VW Golf GTi who have fallen off the track into a ditch. We don’t really have the time, but we have a go – and because we’re working fast, I make a mistake, catching my thumb between the Freelander’s tow pin and hitch. I attach rope and Phil attempts a recovery, while I find a plaster to stop the claret leaking from my digit. We can’t get it out – the Freelander’s clutch won’t take it and we’re just pulling it along the ditch. We’ll have to leave it for someone else. With hindsight, we should have built a ramp for it – or maybe the club should have asked for volunteers to assist from the local 4x4 Response group before the event. We close the section and are on the home run, and as I start to relax, I make a navigational error, missing the final test of the event. We retrace our steps and find it – but I’m so tired I can’t decipher the test diagram, so we decide to visit the marshals and close it, rather than driving it. I look at the clock. We’re just over 20 minutes behind schedule – not too bad, really, and it’s a relief to hand over the score cards and clocks to the organisers and grab something to eat. We’ve struggled even with marked-up maps, no wonder some of the crews found it very difficult. It’s been a great event – challenging navigation and testing driving. Apart from the first test, we haven’t seen any of the competition and very few cars en-route, so we’ve no idea how anyone has done. It’s been exhausting, but great fun. Now, I wonder whether they’ll invite us back next year? Everyone loves a Tonka toy – and now you can have a real-life one of your very own – ideal for those jobs where a normal Land Rover just won’t do, like clearing ditches to help with drainage, or digging footings for a barn to store your burgeoning Land Rover collection. The AirDrive Harrier is a backhoe fitted to a Series IIA 109-inch chassis, and was the company’s demonstrator. It was rebuilt by Series Land Rover expert Rob Maude and we ran a full feature about the rebuild in our August 2017 issue. It is in full working order, complete with the backhoe and comes with the concrete breaker and loads of provenance. It’s up for auction at Cheffins Vintage sale at Machinery Saleground, Sutton, Ely, Cambs, CB6 2QT, on Saturday 20 October – find out more on the Cheffins website. There are probably places most people would prefer to be than on the Coventry Ring Road, but its complex layout makes it the ideal place for real-world testing a self-driving vehicle. The Range Rover Sport has completed the first ever self-driving lap of it, following significant testing on closed road tracks. The trial is part of the £20m government-funded project UK Autodrive. Chosen for its performance and existing features, such as adaptive cruise control, the Sport has been modified to include additional navigation sensors, radar and lidar (laser version of radar). Coupled with the UK Autodrive research, the vehicle can now autonomously handle roundabouts, traffic lights, pedestrians, cyclists and other vehicles on complicated roads. It can also park itself. Mark Cund, Jaguar Land Rover Autonomous Vehicle Research Manager, said: ‘The Coventry Ring Road is known for its complicated slip roads and exits. It makes for very challenging conditions, especially when under pressure in the rush hour. The digital equivalent of a brown envelope filled with pictures being slid under the office door has caused a lot of chatter. A test ‘mule’ for the new Defender has broken cover. There are ways of getting attention and having the hashtag #best4x4xfar in big letters down the side of a mule is a sure-fire way to get it noticed. It may as well have said #lookatme or #nothingtoseehere – both of which would have elicited a similar response. What can we see? Well, very little. Think back to the Discovery days and you had what essentially looked like a Range Rover Classic with a Truckman top on it – that gave a reasonable amount away. On the other hand, the Maestro Van-bodied Freelander mule didn't. All we get from this is a tantalising glimpse of an independently-sprung vehicle, but will it look anything like this? Probably not – the mule looks more like a Discovery 3 than a ‘Defender’. Building instantly-recognisable, modern versions of classics seems to have worked for VW with the Beetle, BMW with the Mini, Fiat with the 500 and more. Get the average man in the street to point out cars in the street and I bet those would be the ones they would find easiest to accurately identify. And though they might miss-label a Series Land Rover as a Defender, they would at least recognise it as being a Land Rover. The mule caught in the pics has a curved windscreen. Could the next generation Defender have a flat screen? Well, Jeep have managed it with the 2019 Wrangler, and Suzuki also have the new Jimny, so it is possible. And advances in technology means roll over protection systems have improved significantly since the 1940s when the Defender can trace its design roots back to – something should be possible. Gerry McGovern, Land Rover's head design bod, said something along the lines of: 'You'll be able to give the new Defender a kicking, and it'll get up for more.' And that's fine – it'll be a workhorse which is what people want a Defender to be. But there are also a lot of people wanting it to look like a Defender – so we’ll just have to keep an eye out for the mules as they slowly shed their disguises. We’ve been driving for forty minutes so far, but are starting to lose time. We’d stopped on the previous phase of the Army Motorsport’s Autumn Leaves navigation rally and crawled into the time control because we were running too early, but a couple of navigation errors on this phase have cost us minutes. And the going is tougher. Navigating across Salisbury Plain in the daytime with GPS is one thing; at night, against the clock and with no electronic assistance, it’s a whole different ball-game. Time is ticking away and we can’t even go quickly to make up time – the ground is too bumpy and throwing our competition-prepared Defender 90 all over the place. We reach another junction. I know where we are and we could cut-and-run along it, but it crosses a ford, and I don’t know how deep it will be. And being off the route, we’re not likely to be found for a while if we get stuck. So we continue to follow the route, skipping round the river. Three other vehicles are now ahead of us and there’s another behind. There’s nothing for it, we’re past our scheduled time at the control – we’ll have to go straight to it. The others turn right – we go straight on, followed by another crew, arriving at the control ten minutes late. And we’re off again. ‘Turn left,’ I call and we shoot up an unsealed road onto the training area. It opens up, but this is a false junction – the one we want is further along. Martin spins the Defender round and we pick up the correct route, peering out for small 10cm square boards with letters on them – control boards to show we’ve followed the correct route. My plot shows straight on, then turn left. We politely thank the man and continue down the road, then turn left, but we find no markers. I re-check the plots and the guy was right – we should have turned left. We’ve lost time, so we accept the penalties for missing the boards (1 point per board) and continue – we don’t want to lose too much time as well, or that will be more penalties. Now we know we’re scoring, we back-off a bit. I’m hugely competitive, but it’s still more about the fun than winning. We could stick to tarmac and cut down on travel time to the next control, or we could enjoy the greenlanes. We choose the latter. Arriving at the time control eight minutes late, we’re racking up the penalties. A long tarmac stretch follows and we follow another Defender along for a while before dropping back and giving them space. We catch them soon enough, though. On top of the Plain mist is forming, reducing the visibility. We dip beam and slow to a crawl. Not only is it tricky to see the road, the code boards are only visible for a few seconds in the beam pattern of the lights. The other crew miss a junction in the fog and we almost do as well, but luckily catch sight of a kerb ending – the only indication there may be a road joining. We nip down it and along another byway and check in at the control right on time. The final phase is right across the middle of the Plain – somewhere you could wind up the speed if you wanted to. Except that there is a 30mph limit on the tracks, and there are marshals with speed guns about. I’ve been caught speeding in competition in events before and it has always cost me trophies – you can miss code boards and make navigation errors, but speeding penalties are avoidable. On the ‘fastest’ section of the track our lights illuminate a marshal who flags us in. We’ve been clocked at 25mph – well within the speed limit. With plenty of time remaining, we dawdle into the final time control and hand in our cards. It’s been a great night’s driving – but we haven’t done as well as we’d hoped. But it’s not all over until all the score cards are in and though we haven’t done fantastically, everyone else has struggled more – and we’ve finished as First Experts, and are overall winners. The 90 is in one piece, we haven’t argued and we’ve got some glassware to take home. Not a bad night out! Want to get involved in Navigation events? 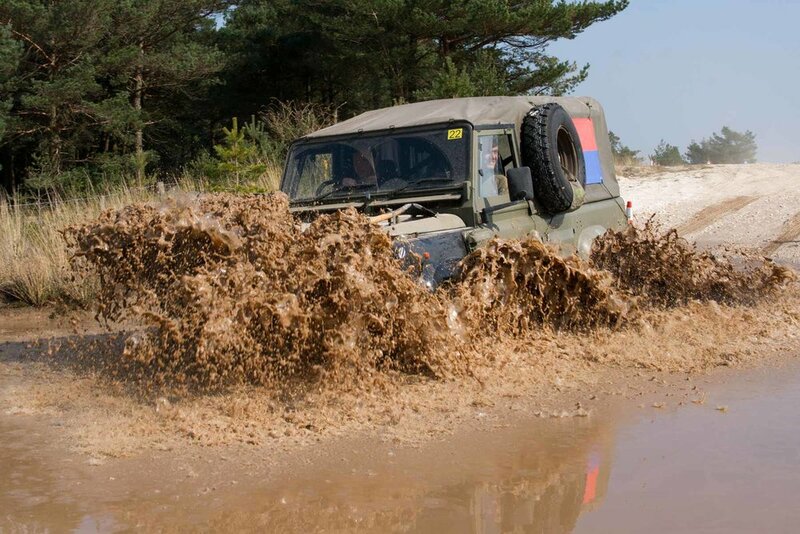 Army Motorsports runs them throughout the year and the next one is GEMM 4x4 Mudmaster, based in Glasgow on 27-28 October 2018. You don’t need to worry about having to beat me on this one – I’ll be marshaling and running one of the phases.